Councils everywhere can always use a little more cash. However, following the recent local body elections, does Auckland now have more Cashmore than even a SuperCity can handle? It’s this straight-forward, pragmatic, no bull approach which has endeared Auckland’s new deputy mayor to many. It may be early days, but Bill is confident that he and Phil Goff can work well together in handling the helm of the SuperCity. “We’re getting on pretty well. Phil’s held a broad range of portfolios and has massive experience in Parliament. Council’s different to central government, but he’s working hard at getting to grips with it, and part of my role is to help him do that,” he says. Despite being a stalwart member of the National Party, Bill believes that a bipartisan approach is often required in local politics. Particularly since being named deputy mayor, Bill has been ‘mind-blowingly busy’, often working more than 12 hours a day. These days, his son Rob keeps a keen eye on the family farm. I ask whether he finds it just as tough to herd councillors as livestock. “They’re different animals, of course. While I can always put sheep on the back of a truck and send them to the works, I can’t do that with elected officials,” he quips as his wife (Lynnette) laughs in the background. Beginning with election to the Clevedon Community Board, Bill has more than 25 years of public service to his name. 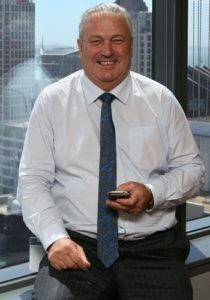 Following various roles with the Auckland Regional Council, he served as a Federated Farmers executive and a representative to the Animal Health Board. And, when Auckland’s councils merged in 2010, his hat was soon back in the local body ring. At the last elections, Bill ran unopposed in a bid to regain his role as Franklin Ward Councillor. I suggest this was because the beggars dared not to take him on. Asked if he has any ambitions to go one better and contest the mayoralty next time, Bill doesn’t hesitate – does he ever? Auckland Deputy Mayor, Bill Cashmore, is confident Auckland’s growing pains will be overcome. Since the unification of councils in 2010, Council has been picking up the pace. While building activity in Auckland is at record levels, he says an extra 40,000 homes (approximately) are required to keep pace with demand. With thousands of new residents intent on making themselves at home in Auckland, could transport nightmares worsen? “While some of this work [on transport] is down to Council, a lot (such as Kiwirail, and the motorway network) is down to the Government. This is what the Auckland Transport Alignment Project is all about. We know what we need, now we’re setting those plans in motion,” he says.